The new generation of mastering the video app has been an obsession long before Instagram took the world by storm; competitors always claim to be the “newest and best thing out there,” sadly, most don’t seem to live up to their name.Unlike those who have been defeated in the video app world, Givit for iPhone is a new app that really knows the video technology. 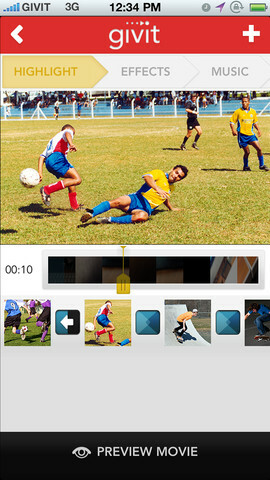 This new app allows the user to create video highlights, add in visual effects and music; all of this can be done as the video is being shot, or older videos can be uploaded to the app and edited as the user pleases. Givit Highlight is created for the user; simple tap-to-clip features and easy to use add-ins ensure that this video app is user friendly. Recording a new skateboarding demo and want to add in a fitting music theme? Givit allows the user to actually upload music from his/her own device, so no cheesy elevator music with this feature! 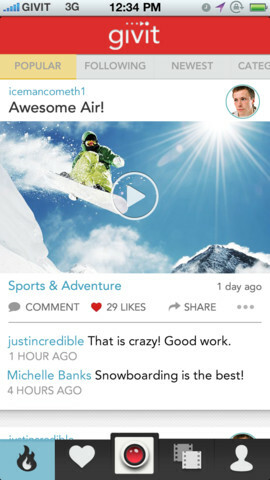 Playing with Givit’s features are sure to create some entertainment in the video recording scheme; slow down highlighted clips, speed them up or replay them once or twice, tap between two clips and add in an edgy transition effect…the list of features and possibilities is endless with this fun video app. Grab theGivit appon iTunes!